Human cells can count their chromosomes – but how do they do? 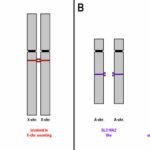 Human cells normally carry 46 chromosomes. There are 2 gonosomes and 22 pairs of autosomes, numbered from 1 through 22. 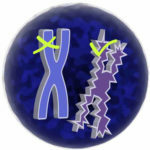 In male there are as gonosomes an X- and a Y-chromosome; in female there are two X-chromosomes.